What happens when the world changes? What happens when it dents – but doesn’t break – and comes to resemble your inner world? 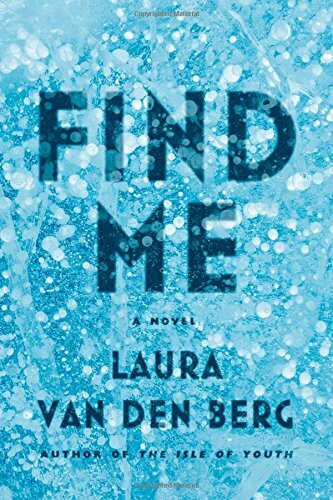 Laura van den Berg’s impressive first novel, Find Me, seeks to answer those questions not through extensive action, but in the unfolding and matching of a stunted soul who learns to make choices. Post-apocalyptic fiction has exploredthe human condition for a long time (utopias are somehow less interesting), and van den Berg’s world resembles them, if only topographically. Unexplained deadly virus? Check. Mysterious hospital and suspicious doctors? Check and check. Love interests who may or may not succumb to apocalyptia? Check. All the ingredients are there, but that’s where similarities end. Find Me is not cast in the same mold as other PA fiction; there is little action and no grand, obvious villain. Instead, the story unfolds slowly through the protagonist’s inaction and quiet, beautiful flashback. Van den Berg knows her way around a sentence, contemplation and subtle philosophy. It’s through these lyrical passages that the point of this story comes about. What does it take to change and grow? Does biology dictate who we are? Does the world reflect itself onto us? Is it the horrors that were inflicted upon us? While the first act sets the stage, establishes the character and the tone, it’s the second act where the action gets underway and Find Me explores these questions – and others – through the quintessential American voyage: the road trip, a shout-out to the exemplars that have gone before (from King’s The Stand to McCarthy’s The Road). How else to explore the disaster’s effect on America and how it reflects inside oneself? There are alternatingly amusing and disturbing mini-adventures during this road trip, notably one featuring drug-induced vision quests and backwoods squatters. That these deeply idiosyncratic characters exist, bowling in the attic and vision-questing in basement tunnels, harkens back to van den Berg’s skill with prose. In another’s hands, these plot points might seem implausible, but we trust van den Berg to guide. She does not disappoint. Readers expecting an action or horror oriented novel instead of a deliberate, thoughtful, beautifully written character study will likely be disappointed. Find Me resembles van den Berg’s story collections The Isle of Youth and What the World Will Look Like When All the Water Leaves Us. There are plots, yes, there is action, but it’s about what’s under the surface, how we change and resemble the world around us. Find Me is about family, found or made, born or borrowed.